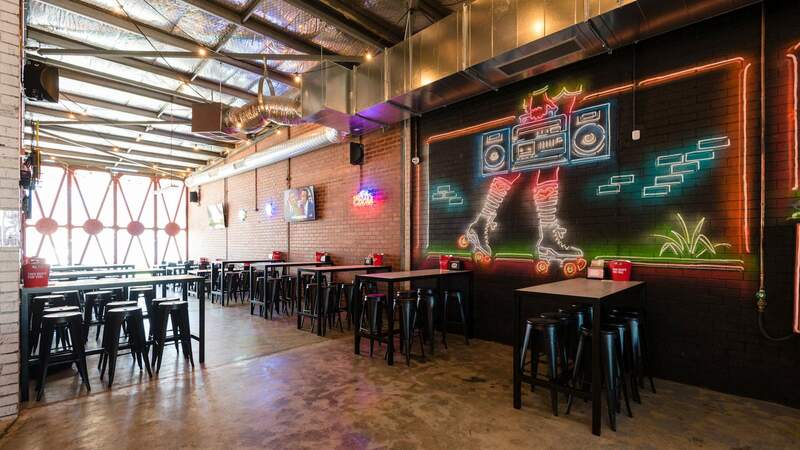 Experience the ultimate college party at this all-American sports bar. The Nedlands original, which was formerly the Basement and part-owned by murdered millionaire Craig Puddy, adopts an American sports bar aesthetic with exposed brick, sporting memorabilia and American flags. And wherever you ensconce yourself among the neon lights, a screen won't be far away. In fact, Varsity Bar doesn't just nod to the game, it's entirely sport obsessed. Nearly every code you can think of scores airtime, from NRL and Little League to tennis and motocross. Good news, though: you can keep your athletic appetite satisfied with American-style bar food, including five types of loaded fries, wings, burgers and pizzas — basically, all of your artery-clogging favourites. You can even order milkshakes — we suggest chocolate marshmallow, strawberry cheesecake or popcorn salted caramel — and spike them with a shot of Baileys, Kahlua, Frangelico or amaretto. From Monday to Friday, you can score a $15 lunch special, which includes a drink, and enjoy happy hour from 5–6pm, where you'll get $2 off every pint on tap. Student life has never looked so good.